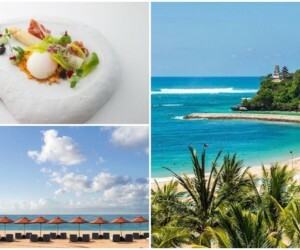 From chic, sustainable bamboo-infused resorts overlooking Padang Padang, to five-star style with Alila Seminyak or the new, all-white beach stay at Bingin, Bali's hottest new addresses are worth checking out.... to check into on your next visit. If ever there was a time to visit the island purely to check into fabulous new accommodation in Bali – villas, hotels, boutique bamboo delights from Uluwatu to Ubud – it’s now. If you’re anything like me, discovering beautiful new places to stay and soak in all that gorgeous Bali-ness gives you a heady rush of passion-fuelled excitement and impatience to book flights immediately! But these ones are even more super-charged than ever. Why? 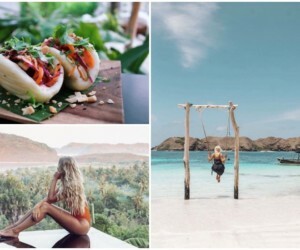 Because they each bring something new, relevant and fabulous to the areas they’ve chosen – and showcase some of Bali’s most stunning and diverse areas to visit. So read on, drool away and get the credit card and calendar in sync… see you there! 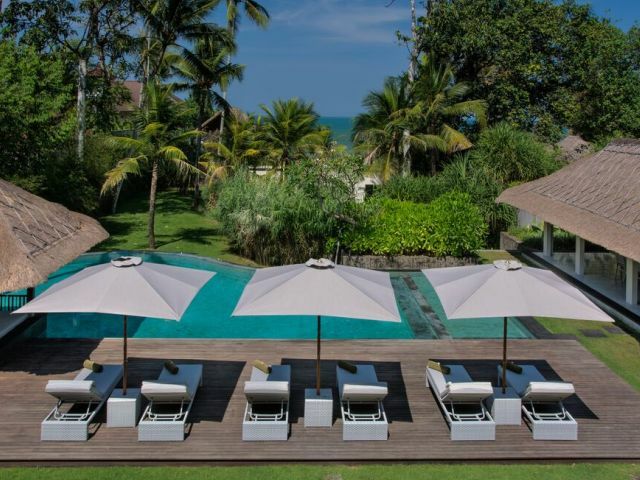 We’re so excited about this stunning, sustainable new boutique resort, overlooking paradise itself at Padang Padang. This one is so new, the doors are barely open so you’re amongst the the first to discover it! Named as a ‘a place of absolute happiness and joy wherein faithful believers are rewarded‘, Suarga Padang Padang by Peppers sensitively adorns the limestone cliffs overlooking Padang Padang, Impossibles surf break and Bingin Beach. Sold! The artistic, sustainable and evocatively designed property enjoys majestic views and features 36 rooms, pavilions and villas (villas, including the ultra-exclusive Villa Bajau set on 1000sqm of cliff-edge gardens, will open in 2016), as well as a season-driven, signature restaurant that showcases captivating ocean views. Dedicated to preserving and reducing their carbon footprint, Suarga Padang Padang by Peppers ensures modern luxuries are provided at minimal cost to that beautiful, surrounding environment. Don’t go past this address. Suarga Padang Padang by Peppers, Jalan Pantai Labuan Sait, Br Dinas Labuan Sait, Pecatu, p. +62 811 399 11 99. You’ve been living under a rock if you haven’t heard about Alila’s Seminyak opening only weeks ago. 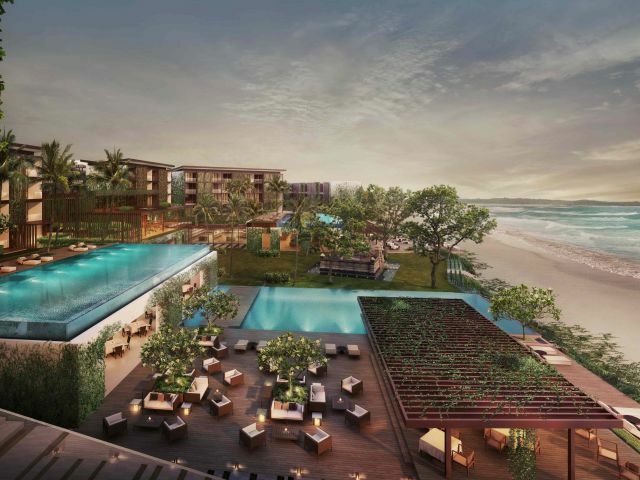 The first non-villa complex of this Indonesian-born, luxury and designer resort brand, this is the hottest address to happen in Seminyak since the opening of the W Hotel and their next-door neighbour, Potato Head. 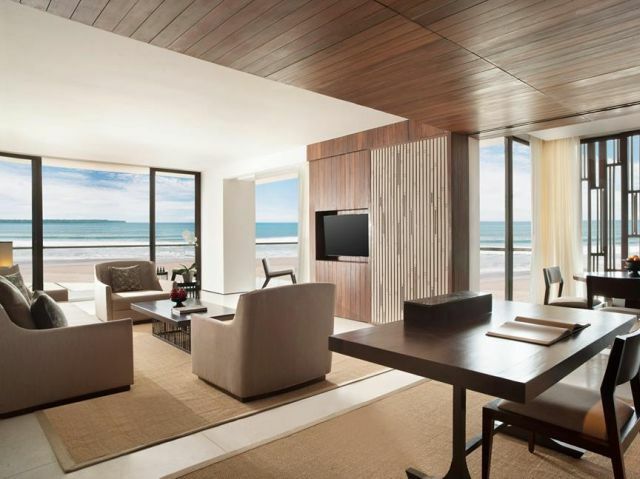 It’s luscious luxe living smack bang in Seminyak’s best, beachfront location. The stunning resort evokes cool and natural sophistication, connected by shimmering pools cascading from a stunning backdrop of vertical gardens. Alila’s fifth property on Bali, Alila Seminyak comprises of 240 contemporary styled rooms and suites with one spectacular penthouse, all embracing uber-cool design and chic comfort. Alila Seminyak is the first resort in Indonesia to surpass the rigorous EarthCheck standards, achieving a 44-point best practice score against the industry norm of five points. Alila Seminyak, Jalan Taman Ganesha No. 5, Petitenget, Seminyak, p. +62 (0) 361 3021 888. Affordable, stylish digs in Uluwatu – hooray! De Sapphire Cliff Villas is a haven of tranquility perched up on Uluwatu’s cliffs, overlooking that million dollar, Indian Ocean view. 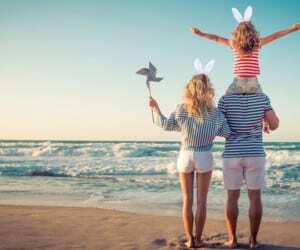 Situated on Impossible Beach, with its dramatic cliffs and sheer drops into the endless surf, the resort offers an experience quite unlike any other in the area. With their own Yoga & Meditation Center, and rooms starting from $120USD per night, this is Bukit bliss with big-style. 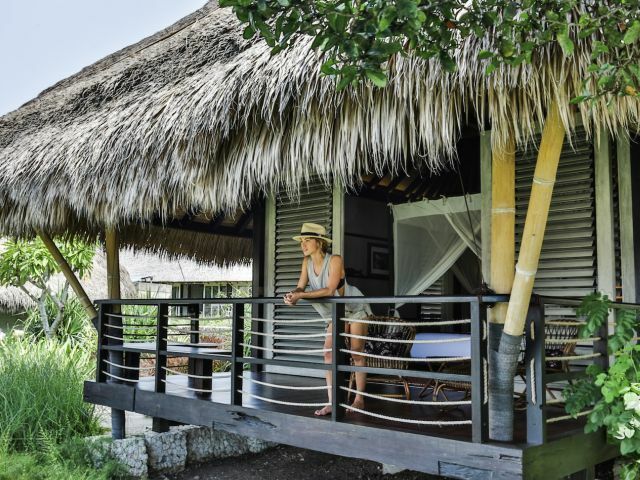 Deluxe Villas feature a double-storey wooden house architecture, with private verandahs surrounded by spectacular views. The nine elegantly appointed single-storey villas are tastefully furnished with exquisite amenities, and the Suite Villas are set higher up to show off those breathtaking Indian Ocean views, with spacious balconies and areas to relax. So surfers and surfing widows alike can happily book in here for weeks on end, and both be entirely happy. 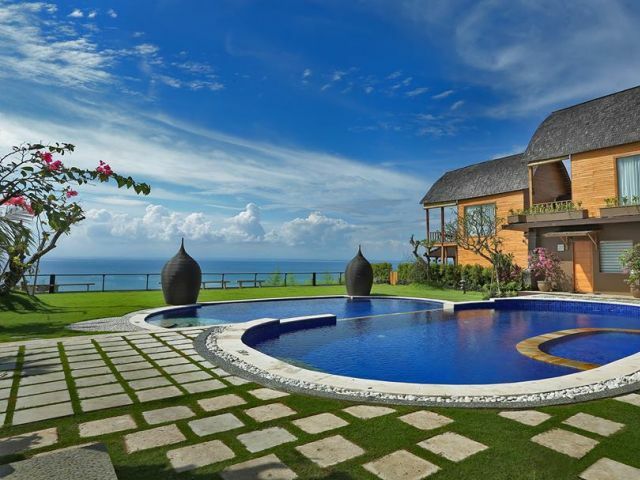 De Sapphire, Jalan Pantai Suluban No 313, Kelurahan Pecatu, Uluwatu, p. +62 (0) 361 8498718. Aaaah Bingin, how we love thee and this little beauty is the best of old and new Bali. This new address is island-chic simplicity at its finest, with simple, all-white surrounds that show off the main attraction: fifty shades of Bingin’s stunning blue views, that stretch out for miles. 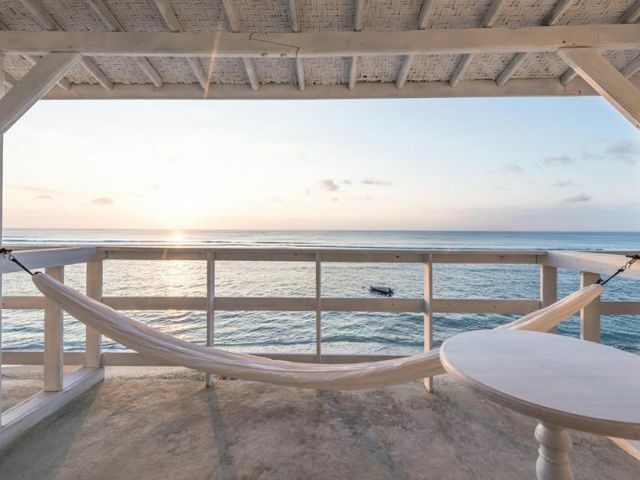 With more than a touch of Insta-friendly vantage points in every direction, The Sun & Surf Stay offers a choice of suites, rooms and dorms all at good prices. This new hotel set-up is for surfers, friends or couples who want to escape the crowds and fancy restaurants, or catch some of Bali’s best waves. Located right on Bingin Beach, it’s prime real estate – and yes that also means dragging your bags and boards up and down all those Bingin steps, but it’s worth it. With surfing & beach dining options right on your doorstep, venturing to nearby with Padang Padang, Uluwatu, Dreamland or Balangan is just even more of a good thing. 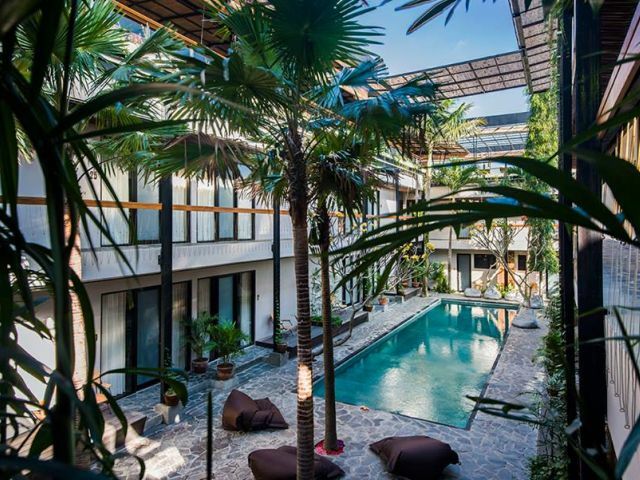 New luxe Canggu villa alert: Where the tranquility and privacy of a more authentic Bali experience merges beautifully with five-star service, style and surrounds. The new addition to these five and six bedroom luxury homes overlook the Indian Ocean in the peaceful rural village of Canggu’s Seseh on Bali’s south-west coast. This is Luxe. Living. Within the villa estate and grounds are more dining, living, entertainment and media pavilions than you’ll ever remember (with multiple master suites amongst the bedrooms set up), a private 14-metre pool with a sun deck, relaxation pavilion and garden of a private-hotel-estate-standard. One of the best things about this address is strolling through the village to meet the friendly locals as they go about their rural work and religious devotion, giving you an authentic glimpse into the daily lives of the people who make this island so warm and welcoming. Weddings and events are a villa specialty, and with these 11 bedrooms, spacious gardens and two swimming pools, it’s the perfect setting for any special occasion or holiday. Seseh Beach II Villas, Seseh Beach Canggu, Bali, p. +62 (0) 361 737498. And now, we change gears and island vibes to head inland. Located in the heart of Ubud, The Shift is a vibrant new community resort promoting social interaction and exchange. The Shift’s vision is to bring people together to share and explore Ubud, yoga and movement in their unique, new setting. 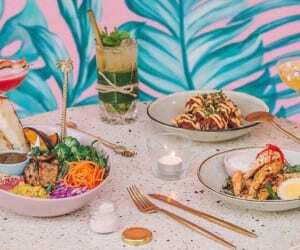 A one of a kind rooftop terrace hosts a vegan eatery, offering a wide variety of plant-based dishes, organic wines and coffee, while The Shift’s yoga & meditation studio provides the optimal setting to uplift your perspective. Also promoting conscious nutrition, The Shift Eatery serves a selection of vegan dishes, drinks, pastry, coffee, wine and beer – their menu was created in collaboration with Alchemy Bali, the island’s first 100% raw vegan restaurant & juice bar, organic health food store, and holistic clinic. Their offerings are free from refined sugar, flour, dairy, wheat & chemical additives, and they support local farmers, sustainable agriculture and environmentally friendly products. Room rates start at great value from $49 USD per night.